Opened in 1906 the Matthews Opera House was the setting for stage productions and traveling shows through the 1930’s. Built by a local Wyoming rancher, Thomas Matthews, at the cost of $50,000, the Opera House opened on December 3, 1906 with a political farce-comedy called “The Lion and the Mouse.” Throughout the next 10 years the popularity of the Opera House remained unquestioned. Many traveling repertory companies paid repeated visits to the Matthews during that time. However, as the decade drew to a close in 1919, competition from “moving pictures” developed in Spearfish and fewer live performances were scheduled. Renamed “The Princess Theater” in 1920, the Matthews was run primarily as a movie house over the next 10 years with occasional live shows still playing on the stage. The “golden age” at the Opera House came to a halt in 1930 when the owner of the Princess Theater moved out and opened a new building down the street. Over the next 25 years the Opera House was used for varied events from a practice basketball court, to a shooting gallery and occasional dance hall. But the elegance of the interior faded as the building fell into general disuse by the mid 1950’s. Broken windows provided easy access to pigeons that roosted among the stage hangings. 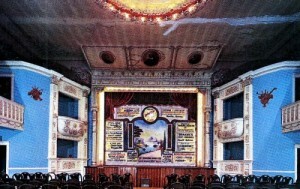 The theatre’s blue period in the 1970s. An effort by local college students in 1956 and ‘57 was attempted to revive the Opera House. The students brought a series of melodramas to the stage during the two summers, but while community support was high, graduation of cast members and financial concerns brought a quick end to the venture. Once more the Opera House went dark and continued to deteriorate. By 1966, the Opera House had been little used for nearly a decade, when another band of intrepid students from Black Hills State College formed a theater company for the summer months and began a small scale renovation of the interior. Known as “Stagecoach Theater,” the student’s efforts were longer lasting than 10 years earlier. What soon became a summer favorite, “The Phantom of the Matthews Opera House,” written by Paul Higbee, opened in 1976. Summer audiences continued to grow through the 80’s, but the conditions of the Opera House were anything but comfortable. The building wasn’t air-conditioned and there was only one single public toilet. By the mid 1980’s it was determined that serious restoration work would be needed to preserve and protect the Opera House if it were to reach its centennial year. The Spearfish Downtown Association took the first step and formed the non-profit Matthews Opera House Society. The building was leased from current owner Mike Kelly with a 95 year, rent free agreement that the restoration would proceed on a timely basis. The first restoration phase was completed by 1989. Work continued into the 90’s and was completed by the end of 2006, the official centennial date of the opening of the Matthews Opera House. Today, the Matthews Opera House is the centerpiece of the Spearfish Arts Center and the home to an active community theater. It is once more an ongoing scene of live theater, concerts and art events throughout the year.